Noilly Prat has just released a brand new recipe for their popular dry vermouth. Wait. No. That’s not right at all. Scratch that. 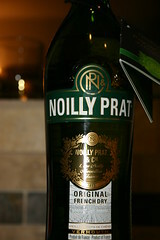 Noilly Prat has discontinued the US version of the dry vermouth that you’ve been drinking for years. In its place, the US will now be partaking of the original 1813 recipe that has always been distributed in Europe. The 1813 recipe is sweeter than the Noilly you’ve gotten used to but I think it’s better too. The color is a bit darker, likely from the barrel aging. Noilly ages their dry vermouth for 8 months in large oak casks indoors and then moves them to smaller barrels which further age another year outside. In addition to the oakiness and slightly sweeter flavor I think the herbal notes are more forward in the 1813 formula, which is also most welcome. Overall I really like this new/old version. One gripe though. As you can see from the picture at the left the bottle came with a tiny booklet explaining the new (old) product and suggesting some serving options. The first is to simply serve it over ice as an aperitif, which I can certainly understand and could go for. The second recipe is for the Ultimate Dry Martini Cocktail which calls for 1 part Noilly Prat dry vermouth to 4 parts Grey Goose vodka. Now, I realize that this is marketing material and they’re trying to appeal to the masses, but seriously? You’re going to call a vodka Martini the ulimate Martini in which your vermouth could be used? I think they could have done better, but alas, that’s why I’m not in marketing. Vya! It’s the only vermouth I’ll use. I like their sweet vermouth better than their dry, but even still… so much better than Noilly or M&R. I’ll have to give this new Noilly a try though. Agreed. Vya is definitely great. I’ve only tried their sweet version though. I think the new (old) Noilly dry is going to work better in certain cocktails. Primarily it will work better in drinks that have some other sweet components as it is slightly sweeter than some other dry vermouths. For example, in the case of a Martini I don’t think the Noilly would be the best choice since there isn’t any other sweetness for it to play off of, but I may have to test that theory.